What you’ll see when you are looping successfully ~20+ minutes later! Temp basals > 6.3, ISF > 255 or carb ratio > 25 with a x23 or x54? Rig Logs and Shortcut commands - bookmark this section! The first step may already be done for you if you purchased a pre-flashed Edison board. The second and third steps are accomplished through what is called the “bootstrap” script. The fourth step is accomplished through what is called the “setup script”. The fifth step is an important, required step. 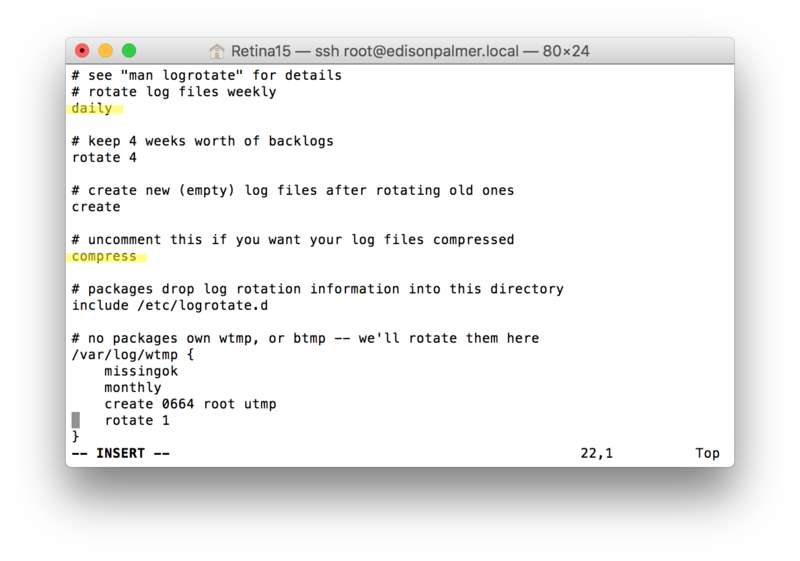 You need to be familiar with how to read and access your logs. 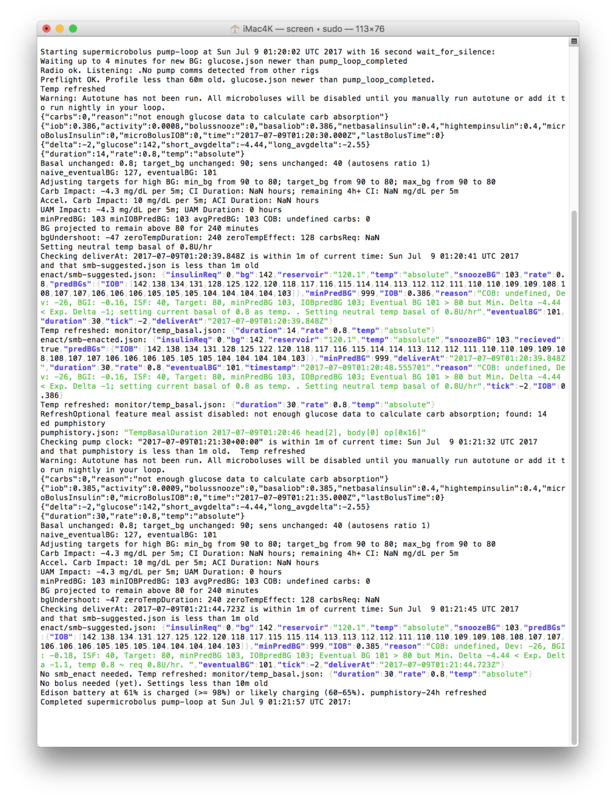 The sixth step is all the polishing steps to your OpenAPS setup. Things like optimizing your settings, preferences, BT-tethering, IFTTT, etc. If you purchased a pre-flashed Edison, you can also skip on down to step 2. If you need to flash your Edison, the directions are slightly different depending on the computer you are using. Please see the Mac-specific flashing page or the Windows-specific flashing page for detailed info on how to flash jubilinux. There is also a more general flashing page here that has some good troubleshooting tips at the end of the page, if you flashing stalls out. Steps 2-3 are covered in the page links below, dependent on which type of rig you are using. If you are using an Intel Edison, start with the Intel Edison instructions. If you are using a Raspberry Pi, start with the Raspberry Pi instructions. Going through steps 1-3 may take about 1-3 hours depending on your internet connection, whether the edison was pre-flashed, and comfort level with the instructions. At the end of the bootstrap script (step 3), you will be asked if you want to continue on with the set-up script (step 4). If you need to take a break and come back to step 4 later, you can answer “no” to continuing on and come back later...picking up at the directions below for running the setup script. If you pressed enter to continuing on with the setup script at the end of the bootstrap script, you do NOT need to specifically enter the command in the box below. By pressing enter to continuing on with setup script, the command was automatically started for you. If you pressed control-c to end at the completion of the bootstrap script and did not continue automatically with setup script, this is where you’ll pick back up. At this point, your rig should have your first wifi connection finished and your dependencies installed. The screenshot below shows an example of the questions you’ll be prompted to reply to during the setup script (oref0-setup). Your answers will depend on the particulars of your setup. Also, don’t expect the rainbow colored background - that’s just to help you see each of the sections it will ask you about! if you’re using a Carelink, you will NOT be using mmeowlink. After you finish setup you need to check if the line radio_type = carelink is present in your pump.ini file. CGM method: The options are g4-upload, g4-local-only, g5, mdt, and xdrip. Note: OpenAPS also attempts to get BG data from your Nightscout. OpenAPS will always use the most recent BG data regardless of the source. As a consequence, if you use FreeStyle Libre or any other CGM system that gets its data only from Nightscout, you’ll be fine choosing any of the options above. Note: G4-upload will allow you to have raw data when the G4 receiver is plugged directly into the rig. Note, you’ll still need to do finish the BT tethering as outlined here after setup. At the end of the questions, the script will ask if you want to continue. Review the information provided in the “to run again with these same options” area...check for any typos. If everything looks correct, then press y to continue. If you see a typo, press n and then type cd && ~/src/oref0/bin/oref0-setup.sh to start the setup questions over again. After the setup script finishes building your loop (called myopenaps), it will ask if you want to schedule a cron (in other words, automate and turn on your loop) and remove any existing cron. You’ll want to answer y to both - and also then press enter to reboot after the cron is installed. If your setup script stalls out before those two questions happen, rerun the setup script again. Make sure that at the end of the setup script, your log rotate file is set to daily as described below. Most users will have the compress line properly edited already, but the log rotate file seems to be left at weekly for many users. 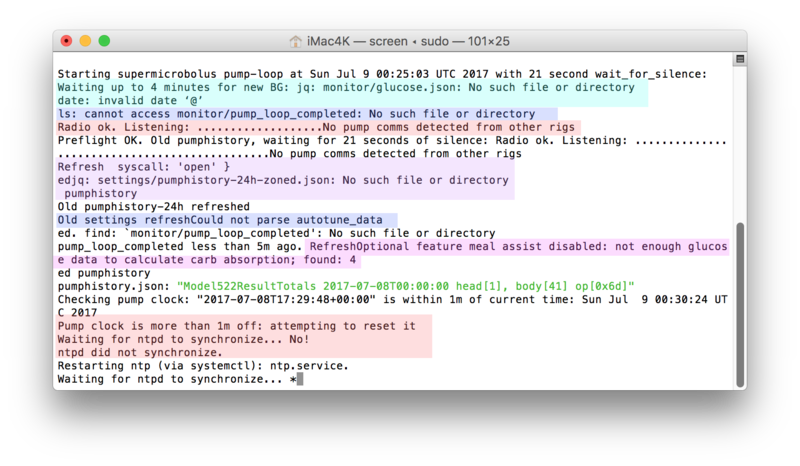 If you leave the setup at weekly, you will likely get a device full error in your pump logs within a week...so please check this before moving on! THIS IS A REQUIRED MUST-LEARN HOW-TO STEP - DO NOT MOVE ON WITHOUT DOING THIS! This is a key skill for monitoring your OpenAPS setup to “check” or “monitor” or “watch” the logs. Don’t worry...once you get a BG reading in, that error will go away. Don’t worry about that one either. It’s only going to show because there hasn’t been a completely loop yet. Once a loop completes, that file gets created and the “error” message will stop. Well, hey that’s actually a good message. It’s saying “I don’t hear any interruptions from other rigs, so I won’t be needing to wait my turn to talk to the pump.” That message will continue to show even when your loop is successfully running. That message will clear out once the pump history has successfully been read. Waiting for ntpd to synchronize....No! "carbs":0, "reason": "not enough glucose data to calculate carb absorption"
Advanced meal assist requires at least 36 BG readings before it can begin to calculate its necessary data. So after about three hours of looping these messages will clear out. You can watch the count-up of “found” BG readings and know when you are getting close. If after 20 minutes, you still have some errors showing instead of the above successful looping information, it may be time to head over to the Troubleshooting oref0-setup tips page for ideas on your error messages and how to resolve them. IF you aren’t able to resolve your errors, please make sure that you have captured the error messages before heading over to Gitter or Facebook to get help. Troubleshooting is far more successful when you come prepared with the error messages. Done watching the logs? Type control-C to exit the pump-loop log. If your rig tries and fails to set a temp basal > 6.3 you should see “ValueError: byte must be in range(0, 256)” in the log. If your pump ISF setting is > 255 the ISF shown in the log and in the OpenAPS pill in Nightscout will be 256 less than the actual pump setting (257 will show as 1). If your pump carb ratio is > 25 and you have a x23 or x54 pump you will see a message about “carb ratio out of bounds” in the log. To fix these problems you need to update decocare. This is easy. Type control-C to exit the pump-loop log. Then copy the following 3 lines to the terminal window. To use these shortcuts, just type in the phrase you see on the left - i.e. edit-wifi and hit enter. You’re looping? Congrats! However, you’re not done quite done yet. Shortly after you confirm your loop is running, you should set your preferences. Don’t forget, your preferences are reset to defaults after each run of a setup script, so please remember to check preferences after confirming a loop is successfully run/rerun. As your time permits, there’s still more useful and cool things you can do to make looping more efficient and automated. Setup Papertrail Papertrail will even allow you to remotely track your logs when you are not logged into your rig. Setting up Papertrail and watching your logs will dramatically help you understand your rig and help troubleshoot if you run into problems. Finish Bluetooth tethering your phone so that when you are away from trusted wifi networks, your rig can automatically access your phone’s mobile hotspot for continued online looping. Learn about offline looping for times when your rig is not able to access internet (no wifi, no hotspot). Additional access to your rig via other types of mobile apps. Grab some of these other apps, based on your preference, for accessing your rig in different ways. Remember, the performance of your DIY closed loop is up to you. Make sure you at least look at the rest of the documentation for help with troubleshooting, ideas about advanced features you can implement in the future when you’re comfortable with baseline looping, and more. Plus, the docs are updated frequently, so it’s worth bookmarking and checking back periodically to see what features and preference options have been added.